On another very hot day at Plessey Road on Saturday, Blyth first 11 went down to another defeat in the Northumberland & Tyneside Cricket League, Division 2. Things will have to change quickly if they are to avoid the drop. Batting first after winning the toss, Seaton Burn, with Jennison and Myburgh, made a steady start against some good bowling from Dave Ebdale. Skipper Kemp was a bit expensive; however, he did make the breakthrough in the 10th over. He had Jennison caught for seven. Lyall came in next and, with Myburgh, added 23 before they were parted. Andy Ebdale came on for Kemp for the 16th over. It was he who took the next wicket in his second over. Myburgh was caught for 23. Kyle came in next and, with Lyall, put together a 60-run stand. Dave Ebdale had come off after nine overs, with Singh taking over. Andy Ebdale also came off and was replaced by Asher. The batsmen brought up the 50 partnership in the 30th over. However, 10 runs later, Asher had Lyall caught for 25. Blacklock was next in; however, he was one of three quick wickets which fell for just 17 runs. Singh took all three wickets. Blacklock was first out, caught for four. Redpath was next to go when he was caught for six. New batsman Kirkwood lasted just three balls when he was caught without scoring. Marshall was next in and, with Kyle, held firm. They added 33 when Asher had Marshall caught for 11. Anderson was next in to join the defiant Kyle, who brought up his half-century with a four off Singh. His 50 came from 83 balls in 95 minutes without any boundaries. However, Kyle was bowled by Asher for 54. Anderson and Ellis held firm until the last over when Anderson was caught off Asher for 16. White was the last man in with Anderson. Anderson finished 19 not out and White, nought not out. Blyth bowling figures were: D Ebdale 0-13, A Kemp 1-22, A Ebdale 1-28, S Singh 3-33 and W Asher 4-48. 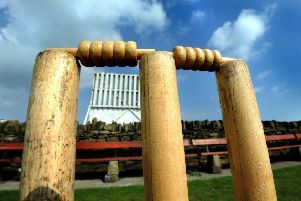 Blyth got off to a terrible start, they lost three wickets for just 15 runs. With seven on the board, Asher was caught for two off White. With no runs added, Clark was caught off Anderson without scoring. 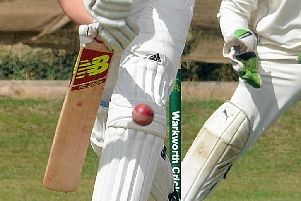 This brought the Ebdale brothers to the wicket, however, with the score on 15, Andy Ebdale was caught for eight off Anderson. White then ripped the middle order to shreds with some excellent bowling, taking the next four wickets. Dave Ebdale held firm as wickets went at the other end. First to go was Roberts bowled for five. Glass was next, trapped lbw without scoring, and Craig Smith also went without scoring, bowled. Then Singh went lbw for six. Walker came in to join Ebdale, who went with four runs added when he was caught for 24 off Marshall. This brought skipper Kemp in to join Walker. The pair finally showed some grit – in just four overs, the pair added 40 runs, with Walker leading from the front. However, Kemp was caught on the boundary for 13 off Marshall. Walker was joined by last man B Blackett and the pair added 31. Walker really went to town, scoring a half-century from just 23 balls in 29 minutes. He brought his 50 up with a huge six and then hit a four off a no-ball as the bowler had to be taken out off the attack for bowling two beamers. Myburgh came on to bowl the last ball of the over and Walker was caught on the boundary for 59. Blacket remained 1 not out. Seaton Burn bowling figures were: A White 5-17, A Anderson 2-37, J Marshall 2-51, J Ellis 0-21 and J Myburgh1-0 from one ball! Blyth seconds’ game against Newcastle was called off on Friday. Next week, Blyth travel to third-placed Bedlington, with a 1.30pm start. Blyth seconds are at home against Kirkley, with a 1pm start.